Get some love and donate to charity, too! Love to read? Love to encourage reading? Love love? 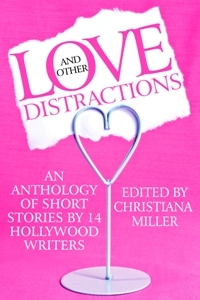 Then check out Love and Other Distractions, a charity anthology with proceeds going to Kids Need to Read. I contributed a fantasy short story to the collection, and I’m joined by a host of other authors who have also worked in Hollywood. While love is the theme, the collection boasts just about every genre, from contemporary romance, to humor, to horror, and back again. Click here for a logline of the stories, or head over to Amazon to buy it. And if you’re not in love with getting it on Amazon, check out the host of other places you can buy it, either as an eBook or a physical book. The idea for the anthology was born when a group of Hollywood writers wanted to put something in print for a change. Fourteen of us donated these stories, and, with a foreword from Hugh Howey, it all came together. The best part, of course, is ALL of the proceeds go to Kids Need to Read, which “works to create a culture of reading for children by providing inspiring books to underfunded schools, libraries, and literacy programs across the United States, especially those serving disadvantaged children.” So if that sounds good to you — and why wouldn’t it? — click on over to Love and Other Distractions now!